How many episodes of Everwood have you seen? Phil Drebbles: People don't really want the truth, they just want good news. Q: Where was Everwood filmed? 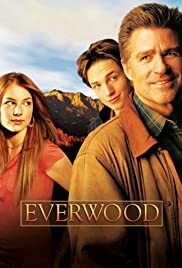 I think Everwood is my favorite new show of the season. The only thing they have in common is that they are both on the WB. A better comparison would be "Everwood" and "Gilmore Girls", but I enjoy this so much better because the acting is better, the characters are better, the scenery is better and the dialogue is better and they don't have that "fast talking Comedic formula" punchline that the Gilmore Girls use about 1,000 times an episode. Don't get me wrong, "Gilmore Girls" is a pretty good show, but this show is better. This show is DEFINATELY worth your time, so don't miss it. The characters of Ephram and Amy have great chemistry and Treat Williams does a fantastic job as Dr. Brown.